After having studied in detail, the work on atomic hydrogen that Irving Langmuir performed 80 years ago (see article Irving Langmuir & Atomic Hydrogen), Mr. Nicholas Moller of Spectrum Investments Ltd decided to experiment with Langmuirs findings in greater depth. To this effect Spectrum Investments Ltd. contracted with Faraday Lab Ltd. of St. Petersburg, Russia in January 2003 in order to verify Langmuirs proof of concept. After a constructive co-operation, Mr. Alexander Frolov, Director of Faraday Lab Ltd. confirmed Mr. Mollers assumption that recombination of atomic hydrogen can be used as physical mechanism for the operation of a practical high efficiency heat source/generator. The main point was to determine what method of the hydrogen dissociation could be efficient. Several different methods (plasma welding, Pd proton-exchange membranes, high-frequency glow discharge and direct heating) were discussed. 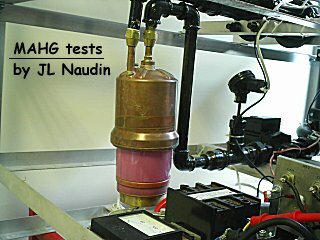 The tube was tested with a12VDC accumulator battery 480AHours that allowed testing of 100A equipment several hours without significant discharge. The tube was heated from AC output, transformator produced by ETA company, max voltage without load is 24VAC. High voltage transformator was made to use 1  1000 V output as anode-cathode voltage. Voltage is DC pulses after rectifier bridge. The tube tested with cold cathode. No current. With hot cathode there is current between anode and cathode. For negative cathode it is usual electron emission, but for positive cathode we can assume that current is a result of hydrogen dissociation, and protons (ionized hydrogen) are working in this case. For positive cathode, it was noted that even for below the break-down voltage there is some current anode-cathode during process of changing of the voltage. It is similar to some induction effect. It was concluded that changes of voltage, i.e. impulses are necessary aspect.Also it was calculated that thermo-emission of tungsten can not be considered as perspective method since the life-time of the filament is very small for big current. A new transformator was produced to test mode of high-frequency discharge between anode and cathode. The significant increase of the heat output was detected at 17:05 msk time. Pulses of 15kHz , current 0.1A and voltage 500V changed output from 1.33 to 1,54 degrees, that is about 200 Wt changes for 50Wt input. 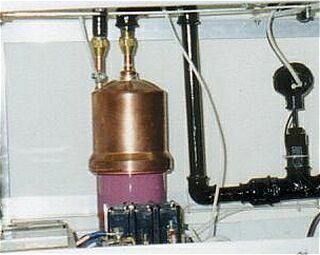 The cathode was connected to positive terminal of the generator. The heating was 12VDC. Also it was concluded that powerful high-frequency generator can be replaced by the arc discharge in open air. Experiments to see if the high frequency discharge anode-cathode can provide sufficient heat to keep the cathode in hot condition concluded inadequate power but discharge can exist some time after heating switch-off. Calculation to estimate possible power output from recombination was made for real concentration of hydrogen in this design. Output from one molecule recombination act is 7.25 10-19 (J). Active area between anode and cathode is about 0.08 (Liter). Heat output from recombination of all hydrogen molecules in this area is about 0.18 (J) if hydrogen is 1% dissociated, i.e. T=2400K. So, frequency of this process must be about 100 kHz to provide 7kWt output. New transformator was made, 50Hz. Interesting conclusion to prove previous assumption about possible mechanism of proton current was made. Increase of AC voltage between anode and cathode produce increase of current (due to electron emission) in the tube between anode and cathode, but for voltage more than 200VAC the current changed its direction. Operation in this mode is possible between 200V and 800V, i.e. below second break-down due to ionization of gas. The question is: why low-energy electrons flow in one direction and high-energy electrons change its direction? Possible answer is interaction between electrons and hydrogen gas. Impulse generator 15kHz produced some significant changes in the heat output. In this case there is arc in air between one terminal of the high frequency generator and the anode. So, more high frequency components were involved in the process besides 15kHz. Formula can be used for output heat calculation if productivity of the cooling system water pump is stable. Also it concluded that for accurate measurements the fan of the cooling system radiator must be quite powerful to provide dissipation of all heat. Cooling of the tube was measured with arc and without arc. Small power of high frequency generator can not provide self-heating of the cathode but time of cooling is more with the arc. A new ignition design was produced. Some significant output heat increase was detected at 19:10, again for positive cathode, i.e it was not a result of the electron emission. 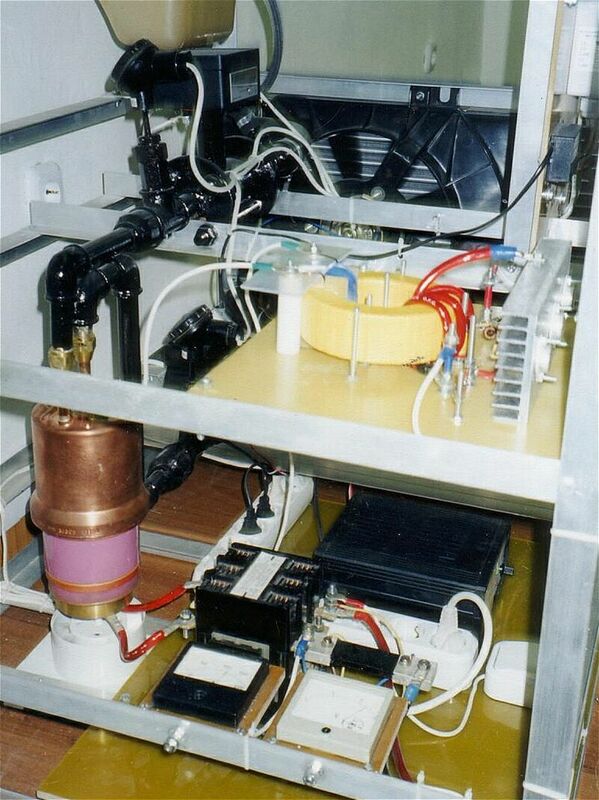 After consideration of possible methods to get high efficient hydrogen dissociation it was assumed that connection of one terminal to cathode from a high voltage source can be effective and can also be used to get anode-cathode current. It was not tested. Experiment to measure dependence output heat  heating voltage. Heating source is pulsed DC from diode rectifier and 24VAC transformator ETA. Conclusion: non-linear curve. Efficiency for the experiment of was calculated. Pout is more than Pin and it seems that the difference is increasing with voltage. But lets looking at the diagram that indicates the efficiency function, it shows max for low voltage area and it is almost stable (about 130%) for other part. An important conclusion was made about possible induction mechanism for impulse mode of heating that can be basis of high efficiency. But still it is not clear why the low voltage area is more efficient. It was assumed that the "warm cathode" is necessary to produce max effects. Perhaps dT/dt i.e. changes of temperature with time is method of generation of some field, which is the reason of additional heating of the gas. In one experiment with sinusoidal heating high efficiency was measured for the low voltage area and some increase of efficiency with voltage. An other experiment was made with DC pulses, rectifier output and efficiency about 124% was calculated that confirmed earlier data. In an experiment with the same connection to the bridge but DC 100Hz pulses smoothed by capacitor, efficiency was only 82%. 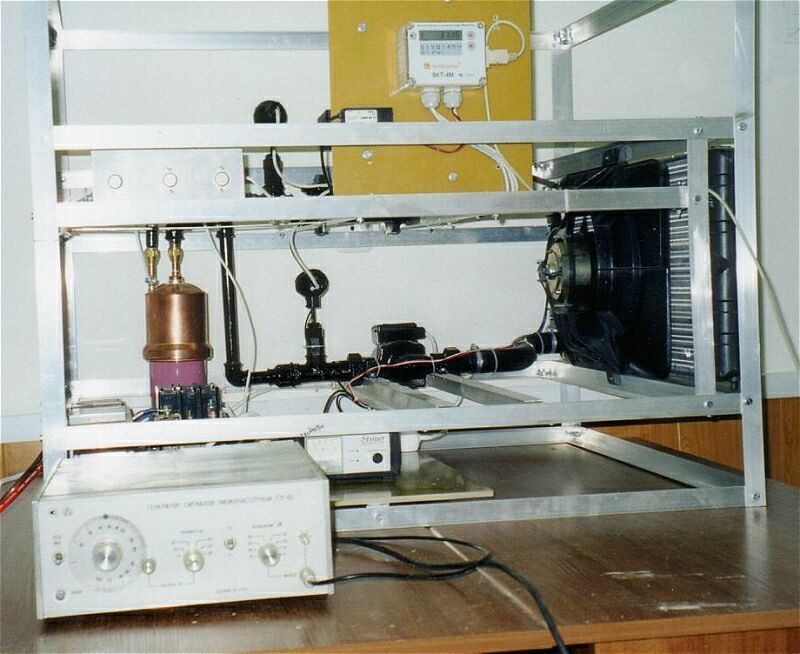 In one experiment with heating of the cathode with half-period pulses produced by diodes, efficiency about 250% and gave reason to think that a possible mistake had been made or about a physical mechanism of this phenomenon. Conclusions were made about interesting low-voltage  low-temperature area of process and about pulsed mode. Increase of temperature corresponded to efficiency increase. But it is necessary to note that in this area of small concentration of atomic hydrogen the influence is not significant. There is the same conclusion about high efficiency of pulsed heating mode processes. To exclude possible mistake in calculations: the flow meter of the water cooling system was tested. Productivity of water pump was measured as 0.92 from initial data. So, correction -8% or factor 973 was used for re-calculation of all tables. One more experiment for sin 50Hz heating method. There is the same conclusion about high efficient low voltage area and increase in area of 16-17 Volt. The overall main conclusion is ,however, a clear indication that low temperature area of experiments with tungsten filament of 500  1500K in hydrogen atmosphere indicate high a efficiency in pulsed mode of operation. It does seem that a new kind of induction phenomenon was detected. In order to benefit from this work, further research is needed. The present design of the tube can be investigated with powerful 500  1000 Wt high frequency generator 100  3000 MHz. Resonance frequency of this tube is calculated as 2500 MHz. It is wave-length 12 cm, standard technical frequency, for example, for microwave oven generator. After high frequency discharge between anode and cathode provides dissociation of the hydrogen then the heating of the cathode can be switch-off. Research should be directed towards the investigation of processes in low temperature area of the tungsten cathode 500  1500K. For such temperatures the design can be more simple, with air cooling and glass body of the device. It is expedient to use design of some standard lightning lamp but filled with hydrogen. The research task is verification of possibility of high efficient heating for 500 -1500K. Technical task is development of low-cost high efficient heater for mass-production. PEM (proton exchange membranes) could also be investigated. This area of research is an example of the system integration projects since PEM is produced for sale. For full details on this project, kindly refer to the Logbook and the short report on the atomic hydrogen project which were computed by Faraday Lab Ltd. for Spectrum Investments Ltd. It is our hope that this material will generate new ideas and initiatives in the efforts to produce viable New Energy Technologies.